Echinacea is an important medicinal herb to have in your garden. Not only is it a pleasure to grow, its uses are limitless. The roots of Echinacea are said to �stimulate the immune system and promote healing. Its�most common use is to ward off the onset of the common cold and to alleviate the effects of a sore throat. 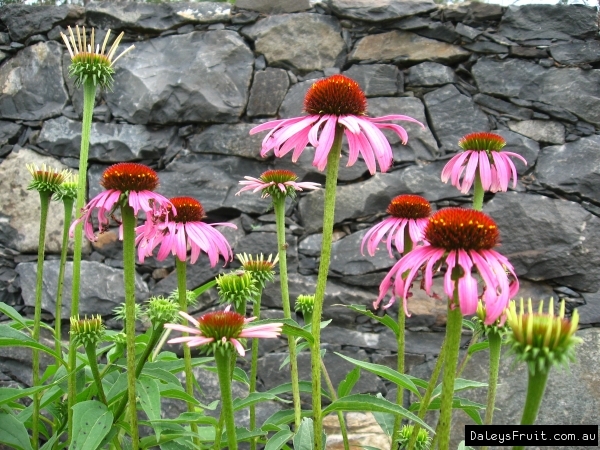 As this is an herbaceous perennial, it will be non existant above the ground for winter.�Echinacea flowers through spring, summer and autumn dieing down over winter then rise again in early spring. Echinacea will self seed or spread from underground roots.�Plant out in an area that you wish to leave them undisturbed for many years. Water and mulch well but take care not to disturb the roots too much. Plant in full sun to partial shade.